I want to thank the Northstar team for taking such good care of my Bella. When she was under a year old she became very sick. When others were telling us to put her down Dr. Anderson never gave up on her. Dr. Anderson and team game my family 8 wonderful years with our Bella. When she was diagnosed with cancer last year Northstar was there for us once again. Thank you for giving us the time we had with our Bella. She brought us so much joy and love and we will miss her every day. We truly want to thank the entire staff of North Star Animal Hospital in Robbinsville for making an extremely difficult day comforting. The moment we walk in with our beloved Mimi we were guided to a comfortable room with a sofa and a view of their beautiful garden. Every staff member that entered the room expressed their sympathy and made sure everything was handled with ease. Once an IV was started on Mimi she was placed on my lap in a cozy blanket. Then the extremely compassionate Vet entered and gently explained everything that was going to happen. We could only feel comfort in knowing our Mimi passed in my arms were she belonged. My husband and I are so grateful to Dr. Grootenboer & Dr. Britton for all they did for our rabbit Champ that was in the hospital for a week with terrible GI Stasis. Their patience, understanding and compassion was amazing and was so reassuring to us that Champ was in the best hands along with the entire staff! We have been bringing our pets to the Robbinsville location for many years and are always extremely pleased with the care they give. Thank you to the doctors, emergency staff, ward staff and desk teams for everything you did to help Champ come home and having the patience with us with visits, questions and concerns. You are all so wonderful. There are simply not enough superlatives to describe our overwhelming gratitude for the staff at NorthStar Vets in Robbinsville. On Saturday, Sept.16th, we brought our critically-ill Dachshund, Harley, to the hospital. She spent the next five days in the ICU. The tender, loving care and compassion she received from Dr. Wiley, Dr. Puchot and the technicians is unsurpassed. The kindness and support we, the family, experienced cannot be matched. We are so grateful to you all for easing our pain and suffering during this very traumatic time. You are truly a compassionate and caring group of professionals. Thank you. The day after Christmas I had to take my best buddy Chloe to NorthStar Vets to have him put to sleep. Chloe was in his 20s and I had been taking care of him for the last 7 years of his life. Words cannot express how thankful I am to Dr. Laura Tasker and the rest of the staff that were working that evening. Since Chloe was old and suffering from kidney disease, I was surprised by how unprepared I was for this moment. I could not stop crying and Dr. Tasker could not have been any more compassionate and caring. She gave me all the time I needed with Chloe before the procedure and the staff allowed me to stay as long as I needed to afterwards. I will forever be thankful for Dr. Tasker and the rest of the staff at NorthStar Vets. I can not say enough nice things about the entire staff at Northstar. On 5/23/16 we were referred to them to have an ultrasound done of our 3 year old Great Dane Max who all of a sudden had trouble emptying his bladder. Everyone was shocked to discover our larger than life family member had cancer that had spread multiple places. Dr. Portner was so kind and explained the options then gave me time to call the family. On a very sad family conference call we all decided saying goodbye to Max was the best option for him. The family poured into the exam room to say goodbye and when we were ready Dr. Portner helped us say goodbye. Their whole team gave us time, choices, space, guidance, comfort and understanding. Having the chance for us all to be together to say goodbye to Max was the greatest gift and I am so grateful to all of the Northstar staff for helping us thru such an unexpected loss. The staff at NorthStar is great! We were visiting family from out of town when our pup suddenly fell ill. It was nice having a place to bring him so far from our regular vet. They were helpful, knowledgable, and informative. The doctor explained every thing he was going to do before he did it and the techs kept us updated the whole time we were out in the waiting room. It was a very stressful situation for us but the staff made it much easier for us and for Mickey. On 4/12/16, We were referred to NorthStar Vets by our primary Vet when, Kasey, our 12 1/2 yr old Pomapoo became gravely Ill. From the moment we walked in the door we were treated with such care and compassion from everyone we came in contact with. We were blessed to have Kasey be seen by their critical care Dr. Laura Tasker. Dr Tasker is one of Gods Angels on earth. She was so gentle and caring with our Kasey and explained everything they wore going to do and promised to call us with the results as soon as they were in.which she did and then answered all our querstions. Unfortunately our Kasey was so severely Ill and we had to make the most heartbreaking decision in our lives for our precious girl but with the help of Dr Tasker we helped Kasey cross over the Rainbow Bridge. Dr Tasker stayed after her shift so she could be there with us to help us through this difficult journey. She made this journey a beautiful experience giving us as much time as we needed to say goodbye and be able to hold our precious Kasey in our arms as she crossed over the Rainbow Bridge with the help of Dr Tasker. Our sincere thanks to everyone at NorthStar Vets and especially to Dr. Laura Tasker for her professionalism and her sincere caring and compassionate nature. nWe will recommend your services to everyone we know. You are a 5 star operation who surpasses all others. Our sincere thanks to you all. A few weeks ago I sent in a testimonial about several members of NorthStars staff. I complimented about a Jessica, I wasnt sure of her last name or initial but now I am and have decided to write one for her. I am speaking of Jess P who works saturdays. She takes care of Christopher Lenoci every saturday and she is just fantastic in every way. Such compassion for Chris and he just loves her. She has even been teaching him the computer, so now he acts like our computer belongs to him...Thanks Jess, lolnA huge thank you to Jess and your whole staff. Thank heavens for Northstar!!! Don't use your regular vet for dental cleanings - make an appointment with Dr. Lewis. He is one of the nicest vets I've ever met and he is so skilled in vet dentistry. I like to think I am always very attuned to my dog's health, but I had no idea my 12 year old doxie had 2 molars with exposed pulp - I felt awful but Dr. Lewis did a first rate job cleaning his teeth and removing the teeth with problems. He actually called me twice during my dog's dental surgery and once after to tell me how it went. Our 12 year old doxie is like a new dog - energetic and happy. We took our other doxie to him as well and she had a molar with exposed pulp and very infected gums - and she is only four years old - so it really does make sense to get dental visits for "young" dogs. It takes us an hour to make the trip to NorthStar and back but it's so worth it. This place is the BEST! I have had good vets in the past but the vets and techs here really LOVE animals. Our original encounter a few years ago with our Cairn Terrier (Roxy) was amazing. We thought she needed an echo and brought a lot of cash with us to pay as our vet warned us it could be very expensive. We met with Dr. DeRose. He almost immediately told us what her diagnosis was and said she did not need the echo. We were charge about $230 when they could have charged us $1200 and not done an echo at all...we would not have know. This time at 14 Roxy had kidney failure and had to stay. Cannot say enough good things about Drs. Ward and Hammer and the techs...especially Christopher whom we met. This is the first time we have had to leave Roxy because she has always been very healthy but we knew she was in very good hands. So happy a NorthStar is opening just a little over a mile from us! Oh and Marge...a GEM!! Love you all. This team deserves a five star rating! When my cat had his second urinary blockage, I knew that it was serious. He had been to another vet who couldn't unblock him, and the prognosis was pretty grim. He could have an operation, or he would die. The vet recommended another facility, but I decided to take him to NorthStar, and I'm glad I did. They explained the options, diagnosis, and prognosis. It was a potentially life-threatening issue, but their professional, caring manner definitely put me at ease. Paxton did not need the operation and came through with flying colors. Their call-backs and updates were great, and I was always treated with respect. It was also a nice touch to be able to hear positive feedback. When I came to visit (which was also a very positive experience) he was clean and obviously well-cared for. It made me feel good that there was a personal touch, and he was not just a cat in cage #3! Adding a personal touch, they said my cat was "handsome" and a "good boy", I thought it was an enormous credit to their customer skills, compassion and professionalism. Although it's never pleasant for a pet to be hospitalized, the staff was caring, personable and professional. I would definitely recommend them to any pet owner! Thanks from me and Paxton! We have used Northstar since they were actually located in Cream Ridge (many moons ago) for any true emergency that has effected our furry companions. nnCocoa, a 13 year old Lab that had a massive tumor that suddenly caused her hind legs to be paralyzed. The staff gave her much love and helped our family say goodbye to our lovely girl in a warm, compassionate environment.nnLilo, a Border Collie mix, at 4-5 months of age was a rescue from a Virginia kill shelter. She came to us extremely ill with a severe case of Kennel Cough and other ailments over a Labor Day weekend. We rushed her over and she was assessed quickly and accurately by the vet staff, giving her the proper medications to bring her back to health. She is now a healthy 11 year old.nnJust a few days ago, on 11/12/2014, we entrusted our newest family member, Ratchet, a 16 week old Maltese/Pomeranian mix into their hands after an accident during play time. Ratchet was in extreme pain and his "screaming" nearly undid us! We called to say we were on our way and started our midnight, 30 minute journey through dense fog. We walked in the door and they were waiting, a tech was assessing Ratchet's condition before we could even start to fill out paperwork. After the initial exam, they immediately gave him pain medication and ushered him to Radiology in the warm embrace of the tech that had greeted us at the door. Dr. Rubello suspected a fracture of his tibia and had the xrays sent over to their radiologist for consultation. It was a difficult thing to diagnose with our tiny Ratchet only weighing in at not quite 4 lbs! They gave our Ratchet such wonderful tender loving care, treating him as if he was their little boy too! nThe professionalism, the caring and understanding they gave to our much loved pup and to us was priceless. Ratchet is on his way to mending now and we are grateful to the staff there for calming him..... and us...in this stressful situation! We never knew how difficult it would be to lose our Astro. We had to put him to sleep suddenly after he suffered a grave illness. It was the most heart breaking episode my family and I have been through in our lifetimes. All we wanted to say was thank you to Dr. Respess and Tina along with the whole staff of Northstar. They made it possible through great advice and compassion to help us through this tragic event. I know my Astro didn't suffer and now he is in a much better place. As far as I am concerned, this is the only place to goto in an emergency. I just want to thank the Dr's and staff from the bottom of my heart for all they have done for Fred. A special thank you to Stephanie. My daughter and I felt a real connection. Every night when we left him I knew her was in good hands. All I talked about was Fred has A girlfriend named Stephanie. She really assured me that Fred would be fine, he just needed time. n nnFred is home now with his sister Sophia and his brother Marvin. He adjusted well. nnThank You, from the bottom of our hearts nnLove Fred. I would like to express my sincere thanks to Dr. Kristina Vygantas. She is a true professional. She operated on my precious little companion and I would recommend her to any pet owner. My Little Sweetie III says thank you too. As hard as it is to put this into words it has to be written. Our story starts in April of 2014 when our primary vet sent us to Northstar for and evaluation by Dr. Kim for his lymphoma. As you can imagine we were terrified as he was only 2 yrs 10 months old. When we arrived not knowing what to expect, we were greeted very kindly with a smile.Dr.Kim Immediately put me at ease, there was something about her. She told us all our options and some were not easy to hear as our boy was very sick, stage 5 lymphoma.We decided on chemo, he went into remission almost immediately, we were overjoyed. We spent many days going back and forth to Northstar over the next months( not a short drive 60 minutes each way ) but it was well worth it.Even when he was sick with a cold or needed blood drawn, I chose the 60 minute drive to northstar as I had become so impressed with the level of care we received, I could not bring myself to trust him to anywhere else but Northstar.When you love someone as much as I loved Clyde you take notice to the people around him. These people.... so to speak of- the doctors( Dr. Kim, Dr. Hammer) and the technicians(Heather, Danielle, Jes) just to mention a few were angels in hiding, as I watched them genuinely care for my boy it made my heart happy. At no time did I feel taken advantage of or put off. We sadly lost our boy in March of 2015. Even at the end we were given the compassion I would want for everyone going through this ordeal and made as comfortable as possible.As for the cost, all I can say is it was worth every penny, and isn't that what really matters in the end. I would also like to mention how clean this facility is and well managed as , I just recently thought about. As when you are going through something like this you forget to mention it. I think I took it for granted, so I wanted to mention it. Please don't hesitate to bring your buddy here as you will be proud that you did. My roller coaster ride with North Star started 11/1/13 when my dog Tessy was diagnosed with Lymphoma. I thought it was the end of the world. I remember Dr. Gutman telling me that Dr. Kim is a wonderful oncologist and she would be in good hands. He was absolutely right. Tessy started chemo on 11/3/13 which happens to be my birthday and although I was heartbroken, in reality, it was the best birthday present I could ever have. Dr. Kim and her staff Heather and Rebecca just to name a couple are wonderful. They put me at ease during such a difficult time and for me it is not an easy task to do. Tessy went into remission right away and remains in remission today. I also have the misfortune of having my heart torn again because my cat Ralphie was also diagnosed with lymphoma (large cell). It was very hard to diagnose him and he had to have surgery to be diagnosed. Dr. Anderson and her staff member Sara (who I will never forget gave me a hug when I really needed it) were great and showed such compassion when my heart was breaking. Right now we are back seeing Dr. Kim with Ralphie once a week which just started on 7/27/14 and while the situation stinks, I feel he is in good hands as well once again under Dr. Kim's care and her staff which includes Diane this time. Thank you North Star! I wish I never had a reason to meet you but I am glad you are there for my beloved furbabies! By the way, we travel one hour each way to North Star and that is on a good day when there is no traffic!!! We just wanted to thank NorthStar for the care provided to our 15 year old Golden Retriever Sunny. The compassion and professionalism Dr. Respess and your staff demonstrated was comforting as we were faced with the most difficult decision of our lives. Receiving a handwritten condolence note from Dr. Respess was an impressive personal touch you do not see very often. We could not have gotten through that day without her guidance. NorthStar exceeded every expectation we had may have had. Thank you. You are the man who saved Eli's life on 7/31/10 and the days that followed it. Eli is the lutino tiel that had the metal poisoning (we were on vacation in NJ). You took him home for extra tube feedings and for that and everything you did for him and us I will be forever appreciative. Eli is doing very well. We love him so much. I have passed along the story of Eli and Dr. Doolen to my fellow Long Island Birdbrains. They took your name down and were so pleased that they have a new avian vet contact! Thanks again so much. God Bless. Northstar lives up to its reputation as a five star facility. The level of professionalism and excellence of care is unsurpassed. Everyone I encountered was very knowledgeable and compassionate. A special thank you to Dr. John Lewis. I could not have asked for a more caring and attentive veterinarian. He personally contacted me pre-op, during, post-op and continued to follow up in the days following despite his busy schedule. He definitely alleviated any separation anxiety I felt when I had to leave my Sparky. Thank you again Dr. Lewis! I brought my dog "Nikki" to Northstar at the end of December 2012 for a neurological consultation. What an amazing place. The facility and staff at Northstar are outstanding. As for the facility, it's state of the art, modern and immaculate. As for the staff, I cannot say enough nice things about them, but the words caring, compassionate, competent, attentive, polite and friendly all come to mind. Northstar is truly a comprehensive veterinary facility with doctors from so many different specialties. I had a chance to meet several of them, including Dr. Logan, the neurologist who coordinated and continues to coordinate Nikki's care; Dr. Motley, the Emergency Department Supervisor who treated Nikki when she had a fainting episode in the lobby at Northstar; and Dr. Anderson, who I met probably ten years ago when she evaluated my Dalmatian "Alex" for kidney disease at Dr. Stobie's original location in Millstone Township. All three doctors are highly trained experts in their fields and thoroughly attended to my dogs' medical issues. At the same time, they are also very down-to-earth, approachable, calming and just really nice. I still keep in touch with Dr. Logan, who has made herself readily available for any questions I have. The medical boarding at Northstar is exceptional. There's a doctor available 24 hours a day. The veterinary nurses are there to monitor Nikki at all times and attend to her every need. Nikki is a very sensitive dog and I have never boarded her until I discovered Northstar. Every veterinary nurse that I have met has been so kind, so compassionate, so caring and genuinely so. I suffer from separation anxiety when it comes to Nikki, but I am completely comfortable boarding her at Northstar knowing that the nurses spoil her. Nikki's final diagnosis is Cognitive Dysfunction Syndrome (CDS), a chronic degenerative condition that I was told is similar to Alzheimer's Disease in humans, and so she will continue to have medical needs. Unrelated to CDS, she also has episodes of vasovagal syncope, when she basically loses consciousness for a brief period. I love my dog so much and I feel very fortunate that Northstar is less than an hour away for her medical needs and for medical boarding. I live an hour away but they were the closest emergency place that also did exotics. I took my hedgehog there on a saturday night and even though it was busy they immediately took her back while I did the paperwork. All the techs and vet were very compassionate and caring and took their time. They also went over estimates of all the possible outcomes for me. She stayed the night and Dr. Doolen operated on her the next day. Unfortunately, she didn't make it but I know they tried everything they could and you could hear the sincerity in Dr. Doolen's voice when he called me. I thank them for their time and compassion and I know if I had made it in time, they could have saved her. If I ever need to bring my other hedgehogs there I know they will be in good hands. The staff always been extremely friendly and helpful. Dr. Hammer spends whatever time is necessary to answer all questions. We have never felt rushed and never felt that she has not given us 100% of her attention. Bandit received the best possible care. She is a typical cat-she hates getting into a cage and is certainly not fond of the 1 hour car trip. But once at NorthStar she transforms into the best behave feline on earth and everyone involved in her care handles her gently and a total caring attitude. My overall experience was excellent money well spent. Our primary Vet-Dr Peter Falk at Ocean County Veterinary Hospital never hesitates with any of our animals to refer any of them to NorthStar if he feels it necessary for the best treatment. I am a physician and feel extremely well qualified to offer an opinion about other physicians. Dr. Hammer is both one of the most caring and one of the brightest Veterinary Physicians I have ever met. No, let me expand that to one of the most caring and brightest physicians i have met-in Veterinary medicine or Human medicine. I want to thank Drs. Guinan, Levin and Kelleher and all the staff who took care of my cat, Sam. I brought him in based on a referral on a Wednesday, he was in for surgery the next day and I brought him home that Saturday. He is still on the mend. I had to bring him in on an emergency basis on Labor Day and even though they were extremely busy they looked him over carefully, stabilized him, met to discuss his situation, and assured me that he was not in crisis and just needs to mend. When Sam's Vet referred me to Northstar I did not know what to expect, but I am relieved that Northstar was there and so is Sam, even though he doesn't realize it yet. I want to thank everyone at Northstar for the most professional care to my little kitty Morocco. I noticed one late night after coming home from a birthday dinner that Morocco was going in and out of his litter box and not producing any urine. I called Northstar immediately, having been given the phone number from my vet for emergency care, and they told me to bring him in right away. Even though being at 2:30am in the morning, they were still completely full staffed and treated Morocco with so much care and urgency. Morocco had to go back the next day because he blocked up again, and this time they kept him and he had surgery. Being home alone with out my "roomate" Morocco for 4 days was a very big challenge to me, but I knew what had to be done for him. He had to have surgery because he had bladder stones. I received many follow up calls after he was discharged, and when he was still in the hospital, I called several times a day to check on him, and even went to visit him. Everyone was always so pleasant and nice each and every time. Now at home, he is back to his old normal self, and he barely even has a scar! 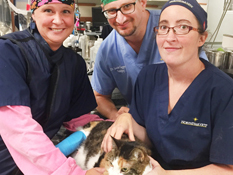 They were even able to take the stitches out of this very finiky and feisty cat! And that is amazing! They saved my kitty's life, and returned him to me as good as new, and I can never express into words how grateful I am. On Behalf of the Filiano family, we would like to thank everyone at Northstar, especially Dr. Anderson, who put in all of the incredible effort to save the life of our cat, Gray. All of the long hours, the care and compassion toward an animal who desperately needed it won't ever go unremembered. Right after the New Year, we noticed one night that Gray was sleeping in the basement, something that was absolutely out of the norm for him. He's the type of cat who wants nothing but softness, and usually is found sleeping on a specific chair. We brought him to our family vet the next morning, to be told flat out that if we did not bring him to an emergency hospital right then he wasn't going to make it. He had gone into acute kidney failure but they weren't sure why. Gray spent four days in Northstar's ICU under the constant care of wonderful people. Although the actual problem was and still remains a mystery, Dr. Anderson decided to treat him as if it were a severe kidney infection. He received fluids, antibiotics, numerous blood work ups and diagnostic testing, all under close, twenty-four hour supervision. Today, Gray is home with us. We almost swear that he's stronger and more lovable now than he ever was before going to Northstar. His tests are coming back absolutely perfect, and he's back to his normal sleeping chair. We will forever be appreciative for everything that Northstar provided for our pet in his time of need. Without your wonderful doctors, and excellent staff, we would have one less member of our family, and we so deeply thank you for that. Thank you so much for all that you have done to save my little girl. I knew that she was in the right hands, when you first saw her and kissed her, calling her "sweetheart". Susan is a great bird, and I feel so bad that all of this has happened to her. However, she is healing well; and she has an even more amazing and trusting relationship with me then ever before. She enjoys following me around the house and spying on the other birds. She is a little bird with a huge attitude!! Please let me know if there is anything else that I should be doing for her. Also, please let me know about continuing/discontinuing her medications and other visits or tests. Thank you, so much Dr. Doolen for everything. You are truly a life saver! We walked in through the doors of NorthStar on Sept 4th. We had never heard of this animal hospital and we were nervous and scared. Our 2 1/2 year old Australian Labradoodle Cali, had a life threatening reaction to an antibiotic. When we left her, we weren't sure we would ever take her home again. Over the next 8 weeks, NorthStar and its staff became our family...Dr's Guinan, Hammer and Anderson provided outstanding care for our beloved little girl. Dr Guinan was her primary internist and through his devotion and dedication there was light at the end of the tunnel. We brought Cali home a week ago after beating all the odds. When her CBC numbers were low the staff comforted us and when the blood results were on the rise, they cheered. What can one say about such an incredible and caring group of people? To all the gals at the front desk, the vet techs and the doctors ( you all know who you are) we will be eternally grateful. You have all become extended family. Cali will be having a birthday soon and we must celebrate! Dr Stobie, your kindness will never be forgotten, you are to be commended on the employ of such a devoted staff. We wish all of you continued strength to do what you do and know we will be right there at your side when you open your new facility. We love you all! I have heard a lot about North Star Vet Hospital from others that have had medical care for their pets. I should have brought Skip to your hospital to begin with, Dr. Guinan was more experienced and very professional and kind to us covering all grounds of our medical problem with Skips, Kidney disease. Skipper is now doing better. My regular Vet is DR. K at the West Trenton Animal and has helped Skipper very much also recommend us to your hospital to see Dr. Guinan and we are very grateful for that. Thank you and your staff for your kind service. I will recommend you to others. Thank you so much for remembering my Peaman. He was a really unique and loving little guy. We are so grateful to have had him in our lives for thirteen years - and he was about two years old when we rescued him. Thanks to you he had a wonderful, active and long life. We can't thank you enough. Here are some of his friends who came to say hello. My family and I would like to express our sincere gratitude to Dr Stobie and his staff for helping our cat, Lilly, through major surgery this past month. Thank you Dr. Stobie for taking the time to fit Lilly into your busy schedule on Saturday 3/6/10 to evaluate her leg mass and for walking us through the process of her leg amputation. I appreciate you returning every one of my phone calls with all the many questions we had in making this decision for Lilly, and for getting her through surgery and then some on 3/16/10. Your expertise, kindness, and professionalism is exceptional. I also want to thank you for making me welcome on my visits to see her after surgery, it was a relief to see her. Thank you to Megan and all of the great receptionists that gladly took all of my phone calls and messages without hesitation. Thank you to all the wonderful technicians who took care of Lilly during her stay. From Chris K who met us at the door and Theresa who kindly took her in on surgery day to Eileen who happily took my phone calls even at midnight when I called for a progress report. I appreciate you all. Thank you to Dr. Kim who remove Lilly's sutures yesterday and who took the time to discuss chemotherapy options with us. Your caring and compassion for oncology is apparent and we appreciate you guiding us and making a difficult decision much easier for us to bear. Lilly is getting stronger and more active each passing day and we hope that with all of the help from our friends at NorthStar VETS she will be happy and pain free for years to come! Two years ago around Christmas time my family brought home a golden retriever puppy who was perfect in every way except that he didn't have toenails on his left front paw. Little did anyone know that it was the early sign of a congenital defect. As he grew, the paw didn't grow with him. As he got bigger, the stubby paw started throwing his entire gait off, eventually affecting both of his hips. When we brought him in for a consultation with Dr. Stobie in April 2010, Bailey literally didn't have a good leg to stand on. It hurt to run or jump, or even to get up from a sitting or lying position. After careful examination and thoughtful consideration of his size and condition, Dr. Stobie recommended total hip replacement surgery for the right hip, which was completely dislocated. This was a truly frightening concept. We had so many questions: How risky was the surgery? What was the incidence of postoperative complications? How long and how hard would the recovery be? How much would Bailey benefit? Over the course of several conversations, Dr. Stobie answered every question I asked, even after I'd asked it for the third, fourth, or fifth time. He understood with incredible compassion (and patience!) that this was not an easy decision to make--Bailey is absolutely the apple of my eye. He put my family in touch with several clients whose dogs had had the same surgery so we could ask what to expect from someone who had been through it. He never rushed us or pushed us to make a decision, but gently and thoughtfully guided us through the decision-making process. Finally, after all of our questions were answered and all the risks and benefits had been carefully weighed, we proceeded with the surgery. Everyone at the hospital has been, without a single exception, top-notch. On the morning of the surgery, Theresa put us completely at ease by explaining exactly what was going to happen between the time we handed over Bailey's leash to her and the time Dr. Stobie called to report after the surgery was complete. And not only did Dr. Stobie call as soon as it was over to tell us that Bailey had done just fine, he called every day when Bailey first came home to check in and see how his recuperation was progressing, even over a weekend. I love Bailey's dedicated tech, Michelle. She's always as excited to see him on our post-op visits as he is to see her. I know my boy is in very good hands when I hand over his leash to Michelle. It is clearly evident that she loves animals, she loves her job and she's outstanding at it. We followed all of Dr. Stobie's postoperative instructions to the letter, and after several post-op checkpoints Bailey is making incredible progress. He is now allowed off his leash in the backyard. I am so happy to report that 12 weeks later, my precious pup, who in early May couldn't walk without serious discomfort, can now run and play, which makes him (and his mom) very happy. Thanks to Dr. Stobie and everyone on staff at NorthStar, he's finally got a good leg to stand on. I have worked for emergency hospitals for my entire 16 yr career, Northstar surpasses all of them in quality of care, competence and attitude. They strive to be the best and do the best for each and every patient. I am honored to have worked there and will continue to refer difficult cases in the future. I totally agree with the last reviewer - we had an AMAZING experience at North Star. We brought our cat in through emergency at 2am in the morning, and the staff couldn't have been more helpful and supportive. Our cat had to stay at North Star for 5 days and during that time he was seen by the emergency vet, a cardiologist, and finally an internal medicine specialist, each of whom I spoke to at least once a day on the phone. The vets kept me up to date completely on the tests they were running and possible diagnoses. I broke down and was crying (embarrasing) on the phone once or twice and the vet was totally supportive and didn't make me feel like an idiot. 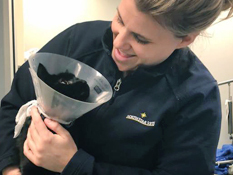 While our cat was at the hospital, we visited him each day - the tech brought him in to a private exam room, gave us an update on his condition and then left him with us for 30 minutes. This was an incredible time that we got to spend with our cat without any restriction. When he was discharged from the hospital, I couldn't believe how reasonable the charge was - all vets are expensive but I thought that North Star's prices were in no way inflated. Also, they take Care Credit, which allowed us to pay the bill over 3 months with no interest charges. Unfortunately our cat only hung on for a few weeks after that (he was diagnosed with FIP, which is fatal), but when we took him back to North Star to put him down, they were SO kind and supportive. The grief support coach spoke with us and all of the staff were so respectful and caring. A few days later, we received a card with handwritten notes from the vets who treated our cat expressing their condolences. If you want a caring, supportive, clean, top-of-the-line medical facility for your pet, you should choose North Star! This place was truly amazing. My dog had a severe seizure/stroke and I thought he was going to die. My regular vet stabilized him and told us to immediately go to NorthStar. NorthStar took us in right away. They had specialized neurologists treat my dog and they quickly diagnosed him with a tumor on his brain stem. My dog was in the hospital for three days. Each day, the doctor spent at least 15-20 minutes on the phone with us and an additional 15-20 minutes during our daily visit to update us on his condition. The doctors provided all of the options to us, and did not make us feel bad about not selecting expensive options like radiation or surgery that would only put him through more suffering. Everyone including the front desk personnel, technicians and doctors were so kind, sympathetic, knowledgeable and helpful. (I can say from recent experience that most people do not receive that level of care and sympathy when they are in the hospital.) The place was immaculate and my dog was well cared for. They give the animals their dignity and even take them to go to the bathroom outside. When he was discharged, we asked for his records to give to our vet and they replied that they had already faxed a copy to him! They even gave us a CD of his X-rays to take with us. How is that for service??!! Yes, all vets are expensive, but that is a price you consider when getting a pet. I did not feel pressured by NorthStar to do unnecessary tests or to keep him in the hospital longer than he needed to be. I also think their prices are comparable with most other vets. They take all forms of payment, including credit cards, and they did not delay emergency treatment until they received a deposit. My dog has been home for a few days and is improving a little each day. The time with him that we have left, which is because of the care he received at NorthStar, made every penny worth it! I just had the most amazing experience at NorthStar VETS! My 6 month old puppy got hit by a car and thrown across the street :( She was hit so hard that her eye detached from her socket! As you can imagine my horror I brought her to my general practice but they immediately referred me to the care of NorthStar. I contacted NorthStar and alerted them that I was on my way and the receptionists were so calming and helpful. As soon as I arrived she was admitted, and they even offered me coffee while I waited! It turned out her eye had to be removed and she would stay overnight but what started out as a horrific experience ended as a best as could be expected. She has one eye now but it has not handicapped her performance as a playful, healthy pup. In fact I think her senses have only been heightened. I have a deep gratitude to the staff and doctors at NorthStar for saving my dogs life and taking excellent care of her! ?